Paul told the new Christians in Galatia not to worry about doing the old traditions that were handed down through Israel. Those traditions and those ways had served their purpose and God was doing a new thing now. "The real children of Abraham...are those who put their faith in God" (Galatians 3:7). God was gathering his people ("the real children of Abraham") together in a new way. And the only sign that marks out the people of God in this updated plan is "faith expressing itself in love" (Galatians 5:6). But that claim didn't sit well with some people. These people came from Jerusalem and insinuated that Paul was a compromiser. They told the new converts that Paul was watering down the message and trying to make it more acceptable to people. The problem, they said, was that Paul wasn't really giving them the full scoop. "I am not trying to please people. I want to please God. Do you think I am trying to please people? If I were doing that, I would not be a servant of Christ" (Galatians 1:10 CEV). He's justifying his motives. He says, "I'm not a people-pleaser who does whatever makes people happy and comfortable; I'm a servant of Christ." Here's where each of us should check ourselves. As you go through your day - in the classroom, at the lunch table, on the practice field, on the job - are you trying to please people, or are you trying to please God? Of course we care about what people think of us, that's fine. The issue is that we don't let what other people think of us define who we are and what we do. 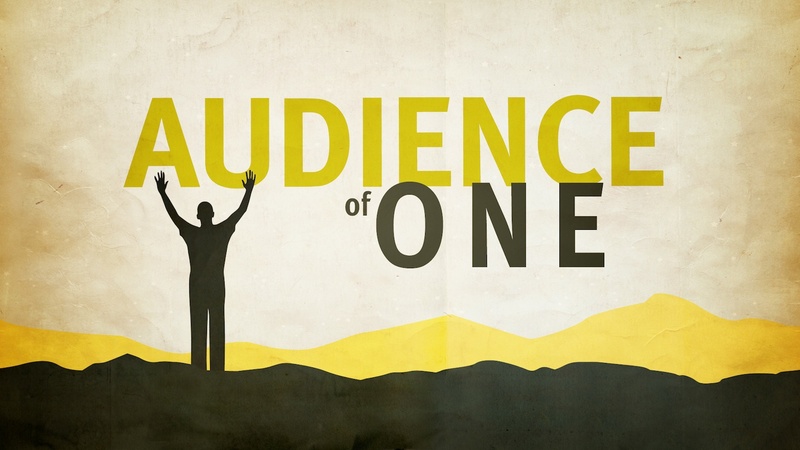 Christian people live for an audience of one. We live for the approval of God alone.